Emperor penguins living in Antarctica are known to huddle close to survive subzero winter temperatures and gale-force winds. New research suggests that within those huddles, the penguins continuously shift the formation and give all individuals time in the warm interior. Though the huddles may look too tight to allow any movement at all, physicist Daniel P. Zitterbart from the University of Erlangen-Nuremberg, Germany, and his colleagues found that the penguins coordinate their movements in periodic waves, observed by shooting high-resolution videos that tracked the movements of individual penguins over the course of several hours. According to the results, published in PLoS ONE on June 1, the waves occur every 30-60 seconds and travel at a speed of 12 centimeters per second. Though each wave results in a relatively small amount of huddle movement, over time the penguins on the outside are shuffled inward, and vice versa. To learn more, Zitterbart is now working to develop a remote-controlled observatory that will allow the researchers to observe the penguins year round. 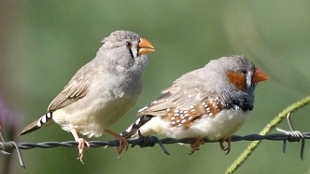 Birds are well known to sing to attract mates, but some mice have also learned to woo their mates with song. And, according to a study published last week in Animal Behaviour, the flashiest performers are most likely to get the girl. 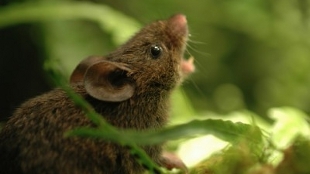 The more rapidly neotropical male mice repeat high-pitch notes and the more frequencies each note covers, the more females responded. But, most males couldn’t pull off both tricks—faster trills were generally composed of a smaller range of frequencies. 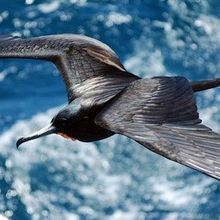 This is the first time a preference for mating song difficulty has been documented in mammals, said Jeffrey Podos, a biologist specializing in vocal behavior at the University of Massachusetts Amherst, though it is also found in many bird species. The trills may inform females about their potential mate's physical condition, the authors suggested. 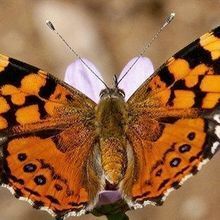 “Elaborate courtship displays require fine coordination of the nervous, neuromuscular and cardiac systems. There is increasing evidence that females evaluate male skills during these displays to determine their overall vigor,” said University of Florida doctoral candidate Bret Pasch in a press release. 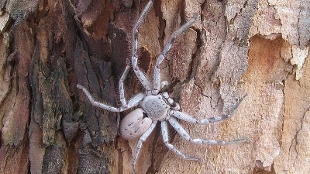 Huntsman spiders display a very unusual social behavior: while most spiders live alone on a web, huntsman spiders live with hundreds of their brethren beneath tree bark. New research has detailed how the spiders work together to benefit from this bizarre living situation. Replacing some of the bark that covered the spiders’ homes with transparent plastic and observing the spiders for two months straight, Cornell University's Eric Yip saw the spiders sometimes bringing the spoils of a hunt back to share, much like an ant community. Furthermore, large “mother spiders” would attack potential predators that came into the nests. 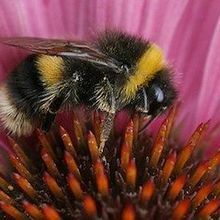 "Mom was very protective of her brood," Yip told BBC News. "And she was usually able to defeat most predators." Other spiders use trickery to avoid getting eaten by predators. Three species of European spiders each mimic the appearance of different kinds of ants, even holding two of their legs in front of them as fake antennae, most likely because many predatory species avoid the spiny, bad-tasting insects. 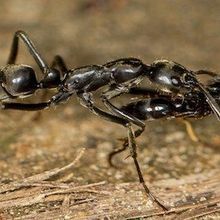 Interestingly, the mimicry isn’t perfect, and a well-trained eye can spot the spiders in a pack of ants, ScienceNOW reports. Stano Pekár, an arachnologist at Masaryk University in Brno, Czech Republic, and his colleagues pitted the spiders against different types of predators in petri dishes, and found that the better mimics—those better at evading ant-avoiding predators—were more susceptible to attacks by two species of ant-hunting spiders. This suggests that an imperfect disguise may be the most successful strategy across predator types. Their results are published in the July issue of The American Naturalist. Finally, the diving bell spider is the only-known spider to evade its predators by living underwater. Filling their silk nets in submerged vegetation with air carried down on their abdomens, the spiders live and reproduce below the surface. Measuring the amount of oxygen in the underwater nests, or diving bells, in the lab, Roger Seymour from the University of Adelaide and Stefan Hetz from Humboldt University in Germany found that the spiders had low metabolic rates and that oxygen from even the most stagnant water would seep into the diving well, giving spiders enough oxygen to survive. But the loss of nitrogen to the water shrinks the bubbles, and the spiders must occasionally capture more air from the surface to restock their homes. Based on their measurements, published earlier this month (June 9) in Journal of Experimental Biology, the researchers calculated that the spiders could survive in their diving bells for more than a day—significantly longer than previous estimates that they had to surface every 20-40 minutes.